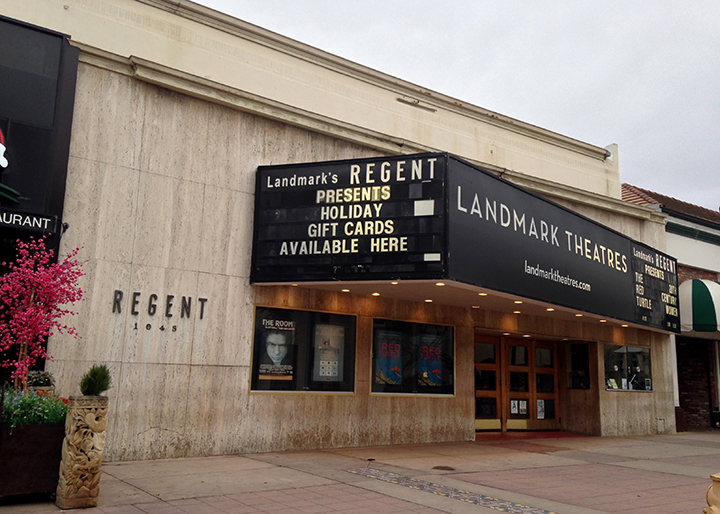 The owners of the Landmark Regent Theatre in Westwood have submitted paperwork to convert the 50-year-old movie house on Broxton Avenue into two restaurants. The neighborhood, once bustling with movie houses and a popular place for splashy premieres, now has three remaining theaters: The Bruin, the Fox, and iPic on Wilshire Boulevard. The Regent was built as retail stores in the 1940s and was a warehouse when Laemmle remodeled it into “L.A.’s Most Beautiful Intimate Theatre” in September 1966. They played art pictures into the 1970s when Mann Theaters, who ran the Fox and the Chinese in Hollywood, acquired it. The Regent upped their cinematic game when Landmark took over in 2002, but this was never a movie palace and the neighborhood seems to have lost interest in movies. In the last decade or so the Avco Cinema was converted into the iPic, and the Crest, Festival, Plaza, National, Mann 4, and UA Westwood have all gone out of business. People might have shifted their viewing habits, but they’re still hungry. Almost all the former theater sites now house restaurants.